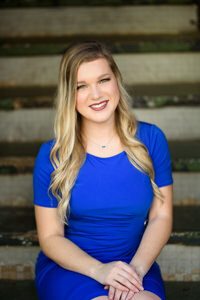 Since June 2018, Meghan has been the friendly face in the front lobby of the Chamber that welcomes out-of-towners visiting the area, as well as our very own locals who come in seeking information about Lufkin/Angelina County. If you have ever called the Chamber for any reason, you have most likely chatted with her. She never meets a stranger and enjoys talking to people about the weather, news in Lufkin, music, or anything you’re interested in. Have a question about local events, need contact information or help finding a local business or office in Angelina County? Stop by or give us a call--Meghan will tell you what you need to know. We have a variety of pamphlets and brochures in our lobby regarding our local area as well as information from all across our Lone Star State. She is happy to visit with you and let you know which brochures are best for you according to what you are seeking out. Meghan is proud of her town and wants visitors to feel right at home while here. Meghan has dedicated a large portion of her life to gymnastics and competitive cheer. She even cheered for Stephen F. Austin State University. She still finds opportunities to be involved by being a judge for cheer competitions. When she has the chance, she loves to scuba dive anywhere water is found. Her favorite food has always been and will always be her mom's chicken and dumplings. Meghan was born and raised in Lufkin. She loves living in Lufkin and being close to her family, but dreams of moving to New York in the future to pursue a career in medical aesthetics. We're hoping that's a really long time from now because she is such a great asset to our Chamber team!